Chepstow Museum01291 625981work MuseumChepstow Museum reveals the rich and varied past of this ancient town, once an important port and market centre. The wine trade, shipbuilding and salmon fishing are among Chepstow's many industries featured in displays with atmospheric settings. Photographs, programmes and posters recall the pastimes of local people, whilst 18th and 19th century paintings and prints illustrate the everlasting appeal of Chepstow and the Wye Valley to artists and tourists alike. The Museum is just across the road from Chepstow Castle in an elegant 18th century house built by a prosperous Chepstow merchant family. 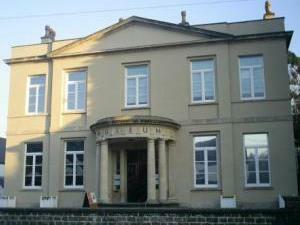 Chepstow Museum reveals the rich and varied past of this ancient town, once an important port and market centre. The wine trade, shipbuilding and salmon fishing are among Chepstow's many industries featured in displays with atmospheric settings. Photographs, programmes and posters recall the pastimes of local people, whilst 18th and 19th century paintings and prints illustrate the everlasting appeal of Chepstow and the Wye Valley to artists and tourists alike. The Museum is just across the road from Chepstow Castle in an elegant 18th century house built by a prosperous Chepstow merchant family.